Notes: Local in woodland on chalky soils throughout England, Wales and southern Ireland. 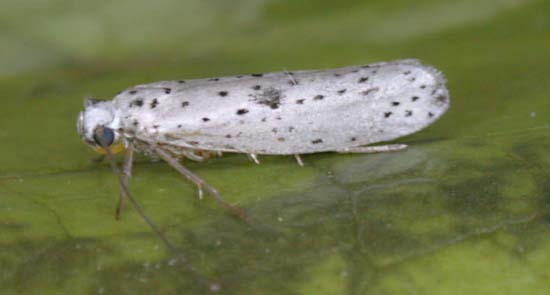 Widespread and fairly common in Hampshire and on the Isle of Wight. Wingspan 17-19 mm. One of the more distinctive Yponomeuta, distinguished by the small black spot in the centre of the forewing. Larva feeds on Spindle, living within a silken web.